If you like punk rock and power chords, you’ll love our electric guitar lesson on American Idiot. The song has a couple of very nice chord progressions and interesting strumming patterns, that will really develop your knowledge of power chords, and your power chord strumming technique. You’ll be strumming power chords very fast in American Idiot, which requires you to strum up-down, a technique not as easy as it seems, since you need to concentrate on strumming just 2-3 strings, without hitting the rest of the strings. 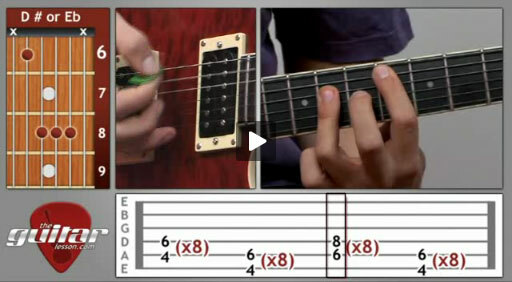 The song also has a couple of nice licks, which will develop your single string alternate picking technique. And as with most punk rock songs, you will be playing it under heavy distortion, which is great if you like the genre. Once you're done, check out some more of our guitar lessons for beginners. American Idiot is the first single from Green Day’s 7th album, American Idiot, released in 2004. This song was a real breakthrough for Green Day, as their career had been on the low for a while. This song brought the band recognition in the UK as well, as it became their first top 5 single. The song was featured in a number of movies, such as Simpsons: The Movie and Wedding Crashers. Sorry, but you've reached a premium content area. The download of the American Idiot tablature file is only available to premium members. Sorry, the same goes for the backing track. To download the backing track to American Idiot, please log in and revisit this page.